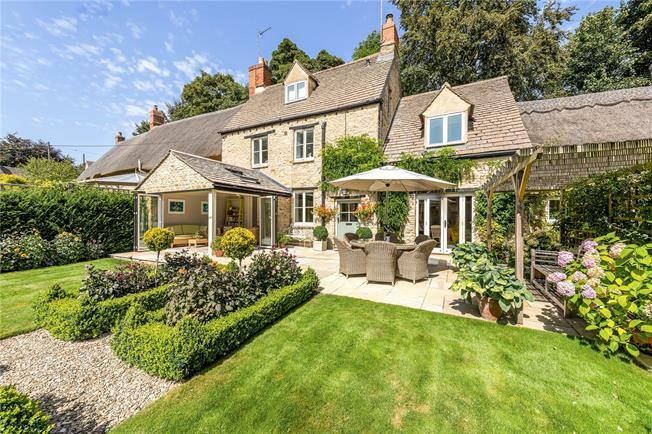 4 Bedroom Semi Detached House For Sale in Chipping Norton, Oxfordsh for Guide Price £850,000. This Grade II Listed period home has been transformed by the current owners and now provides a wonderful, high quality, character property situated in a sought after rural location. The main part of the house includes an entrance hall, stunning sitting room/dining room with exposed beams, window seat, stone inglenook fireplace with wood burning stove, ornamental fireplace. Doors lead to the garden room which has double bi-fold doors opening on to the delightful patio and gardens. There is an excellent kitchen/breakfast room fitted with an attractive range of painted oak base units fitted with Beech worktops with inset double 'Belfast' sink. There is a built in fridge/freezer and dishwasher, walk in larder cupboard and a range cooker. Off the kitchen there is downstairs cloakroom and utility room, from which a door provides access to the cottage.